Frank Henry Mason RI RSMA (1876-1965). Oil painting on board, Signed. Provenance: The Estate of Arthur Balfour, 1st Baron Riverdale (1873-1957). A note attached, verso, states: “Bonhams 26th October 2005. Lot 91. Estimate £4,000-6,000”. Her heroic exploits on the Yangtze River over, HMS AMETHYST (Lieutenant Commander J S Kerans DSO) was ordered home from the Far East Station to pay off and refit. 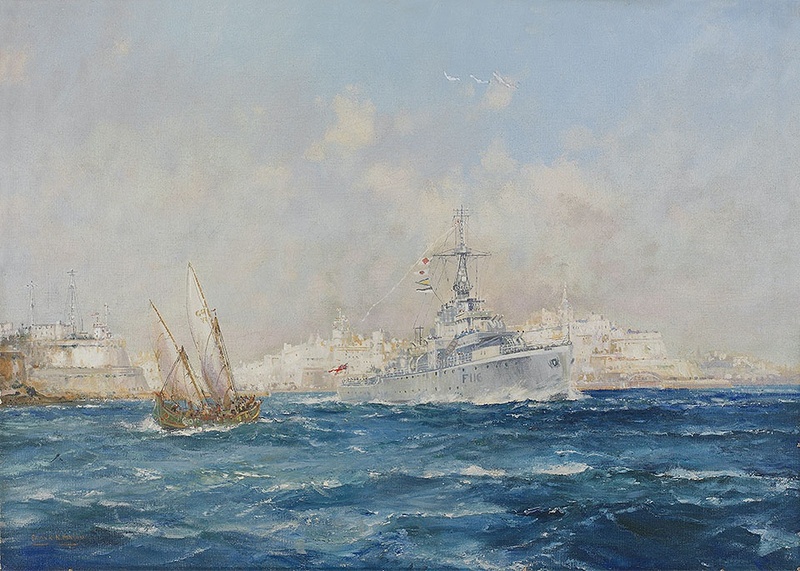 She is painted here by Frank Mason leaving Grand Harbour Malta with her 200 foot long paying off pennant streaming, her penultimate stop on the journey back to Devonport. A watercolour print by Eric Tufnell of her making her escape down the Yangtze also appears on this website (see MP 168). As with all her ports of call after she had broken out of the Yangtze on the last day of July 1949, she had been given a rapturous welcome. After that first rendezvous in the Yangtze with HMS CONCORD (Commander N R Rodney) who had been sent by the Commander-in-Chief Far East to give AMETHYST covering fire and support as she sped her way down river and to freedom, AMETHYST had been well feted. Once safely clear of the river mouth and having made the memorable signal to the waiting outside world: “Have rejoined the Fleet south of Woosung. No casualties or damage. God Save the King”, AMETHYST had been refuelled by CONCORD who gingerly came alongside the scarred and rusty frigate to transfer not only critically needed fuel but also fresh charts, bread, NAAFI treats and one or two officers and ratings to plug vital gaps in AMETHYST’s depleted ship's company so that she could make the passage to Hong Kong safely. Captain (D) 8 in HMS COSSACK (Captain R T White DSO**) had relieved CONCORD and escorted her to the Saddle Islands and the Flag Officer Second in Command Far East, Vice Admiral A C G Madden, had joined her at sea in his flagship, the cruiser JAMAICA (Captain F A Ballance DSO) for part of the passage south to Hong Kong. The Commander-in-Chief Far East, Admiral Sir Patrick Brind, had personally welcomed her into Hong Kong from his flagship HMS BELFAST (Captain E K Le Mesurier CBE) and shortly afterwards, on 5th August, the award of the DSO for Kerans and other decorations for members of AMETHYST’s who had played a prominent part in the initial action, the incarceration and subsequent escape, were gazetted. Some essential repairs and maintenance in HM Dockyard there in Hong Kong and revictualling and storing complete, AMETHYST started on her long homeward journey via the naval bases of Singapore, Trincomalee, Aden and Port Said and now Malta on 18th October where the Mediterranean Fleet, led by the Commander-in-Chief Mediterranean, Admiral Sir Arthur Power, made very clear the esteem in which they held the frigate. An official reception was held by the Second-in-Command, Mediterranean, Vice Admiral the Hon C E Douglas-Pennant and there were innumerable smaller and informal parties to welcome the AMETHYSTs - everyone wanted to hear what it had been like, how they had coped, what happened during the escape passage down the Yangtze! Then it was Gibraltar before one final leg of the voyage where, on 1st November, AMETHYST finally arrived in her homeport of Devonport. The First Lord of the Admiralty and the Commander-in-Chief, Plymouth, Admiral Sir Robert Burnett were there as the frigate berthed at No 6 Wharf, astern of the battleship HMS VANGUARD (Captain Gerald Gladstone RN). More speeches followed (including the laconic “AMETHYST, well done: up to standard” from the C-in-C!) , and more receptions and march pasts but at last many of the ships company who had been wounded and had been evacuated from AMETHYST in April in the Yangtze were able to rejoin their old ship. And there was the widely acclaimed award of the Dickin medal for Simon, the ship’s black and white cat, who had so fearlessly and gallantly in the King's name slain many rodents onboard whilst the frigate had been swinging round her anchor in the sweltering conditions of the river in summer -the only time a cat has been so honoured with this medal, “the animals’ Victoria Cross”. Frank Mason was born in Seaton Carew, County Durham in October 1876 and was educated on the training ship HMS CONWAY. He went to sea, became an engineer in the shipbuilding industry and when war broke out in 1914, joined the RNVR. He had already started to make a name as an artist (he exhibited at the Royal Academy from the early years of the 20th century) and during WW2 he became well known for his patriotic posters – mostly for maritime causes and the railways. He would have been very attracted to the AMETHYST story – hence this painting - and his works are well fought over when he appears at auction these days.